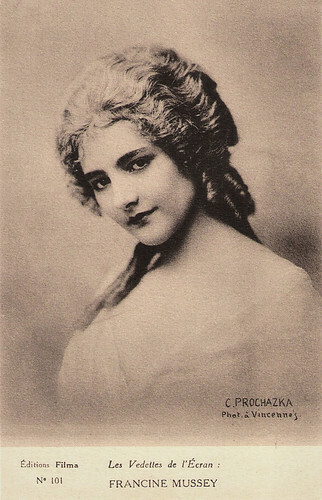 French film actress Francine Mussey (1897-1933) appeared in several French and German films. Her career began in the silent film era of the 1920s and ended in 1933 when she committed suicide by ingesting poison at age 35. French postcard in the Les Vedettes de l'Écran series by Editions Filma, no. 101. Photo: C. Prochazka, Vincennes. Francine Mussey was born in the 18th arrondissement of Paris as Marcelle Fromholt in 1897. She made her debut in the silent film L'épave/The Pavement (Lucien Lehmann, 1920), opposite actors Marcel Bonneau and Jean-François Martial. In the French silent film La maison du mystère/The House of Mystery (Alexandre Volkoff, 1923), she co-starred with Russian film star Ivan Mozzhukhin and Charles Vanel. Henry Miyamoto at IMDb: "An art film shot as a serial. An imaginative wedding scene shot in silhouette, begins a tale of murder blackmail and romance covering a period of about 18 years, ending around 1923. The film had the MOMA audience breaking out into applause at the end of each chapter, starting from about chapter 3. At the June 28, 2003 showing at the Gramercy Theatre in New York, only 2 people left of the 150 people who came to see the film, and they came back to see the end of the film. A remarkable feat since the film ran over 7 hours." Francine Mussey played in Germany opposite Ernst Verebes in Der Mann im Sattel/The Man in the Saddle (Manfred Noa, 1925). She appeared in the classic epic Napoléon vu par Abel Gance/Napoléon (Abel Gance, 1927) which tells the story of Napoleon's early years. The film runs for five and a half hours and is now seen as one of the greatest masterpieces of the silent cinema. Mussey would go on to appear in a number of films throughout the 1920s and into the sound film era of the early 1930s. In Germany she played a supporting part in Die Frau die nicht nein sagen kann/The Woman Who Couldn't Say No (Fred Sauer, 1927) starring Lee Parry, Gustav Fröhlich and Hans Albers. For Warner Bros, she co-starred with Jean Gabin in the sound film La foule hurle (Jean Daumerie, Howard Hawks, 1932). It was the alternate language version of The Crowd Roars (Howard Hawks, 1932) with James Cagney and Joan Blondell. Her last film was the French comedy L'âne de Buridan/Buridan's Donkey (Alexandre Ryder, 1932) starring René Lefèvre, Colette Darfeuil and Mona Goya. Only 35, Francine Mussey died in 1933 in Paris. She committed suicide by ingesting poison. She was married to rowing ace Jean-Pierre Stock. Cinémagazine (April 1933): "The loss of her child a little more than a year ago, and the discouragement of this continual struggle that is cinema have led to this fatal Resolution". Trailer La Maison du mystère/The House of Mystery (1923). Source: Flicker Alley (Vimeo). Source: Cinémagazine (French), Wikipedia (French and English) and IMDb.